For many years I have been fascinated by the concept of wild food foraging, yet I have never studied the field, in as much detail, as I did this autumn. Below are a few wild mushrooms I learned how to identify this autumn. Some of these mushrooms I would consider 'safe to eat' as (with, of course, due caution) you could very easily distinguish these fungi from their poisonous look-a-likes. The Parasol Mushroom (Macrolepiota Procera) is a wonderful tasting mushroom with a few key identifiers that make it stand out from other fungi. The fungus starts its life with an egg-shaped cap and a long thin stem. The cap, which is white marked with immovable brown scales, flattens out in later life leaving a ring on its stem. The mushroom has white gills and grows predominantly in grasslands but have been reportedly found in woodlands. One of it's most obvious differences with the family of mushrooms they are most commonly mistaken for (the potentially deadly, Lepiota family) is its size. The parasol mushroom is significantly larger than any of its poisonous look-a-likes. The most significant difference between this mushroom and fungi from the lepiota family is its 'snake-like' markings on the stem. Another pleasant and tasty mushroom in the Macrolepiota family is the Shaggy Parasol. This charming mushroom is one to stay away from! The Fly Agaric (Amanita Muscaria) is a poisonous mushroom which is most commonly found in woodlands around beech trees. The white fragments on the cap that may wash off in rain are remnants from the 'universal veil' that covered the fungus during its 'egg stage'. The fungus has a striking red cap which flattens out to reveal its white gills. Despite the mushroom being poisonous (the main poison being muscarine) it is often consumed by people who are after its psychedelic effects! Indeed, this mushroom will make you high! Other species also enjoy the effects of the Fly Agaric, such as Reindeer. So much, in fact, that Reindeer herders often used fly agarics to herd entire groups of reindeer. The Fly Agaric can, in high quantities, cause serious long-term damage and potentially death so it is not recommended. Out of the main celebrity mushrooms, this one would have to be my favorite! 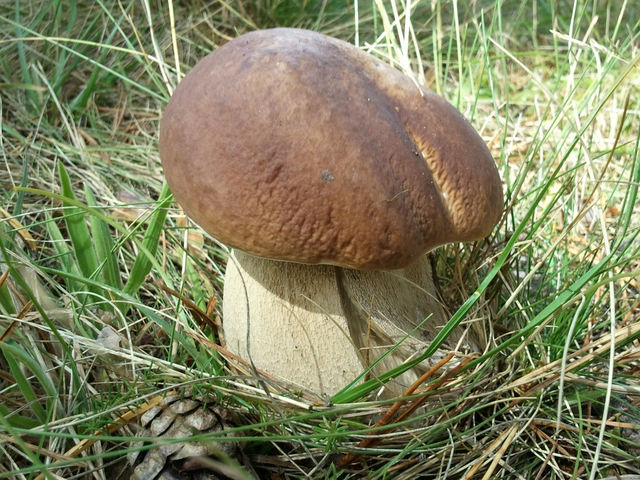 The Penny Bun (Boletus Edulis) also known to the French as The Cep, the Italians as The Porcini, and the Americans as The King Bolete. You know its good when it has that many names! This mushroom has a thick, swollen white stem that leads to the firm, brown cap. The cap often has irregular dimples around the edges (as an actual bun would) with the outer edges often fading white. If you look underneath, you will not find gills. Instead, you find pores. This sponge-like substance underneath the cap will allow identifying that the mushroom is in the Boletus family. The pores on the Penny Bun start in young specimens as white but will fade yellow and then green. The flesh will remain white and firm. This mushroom is almost too good to miss, yet we humans are not the only ones who think so! Mushroom flies love to lay maggots into these mushrooms and often times in great quantities. It is very rare to find a maggot-free Penny Bun, so you will have to settle with at least a few maggots in your mushroom. The Orange Birch Bolete is another tasty mushroom found in the Boletus family. This mushroom can be found in similar territory to the Penny Bun. Due to its distinct black 'dot' markings on the thick, white stem, the orange birch bolete is nothing like any poisonous boletes. The cap is, as its name suggests, orange. The only mushrooms this could be mistaken for are the brown birch bolete and the less common red oak bolete. The brown birch bolete is less tasty and is not commonly recommended for consumption. The red oak bolete has a distinguishable red cap. The Porcelain Fungus is often avoided by wearisome foragers due to its incredibly slimy cap. It is, once you wash off the slime, a truly delicious mushroom that is very easy and safe to identify. It grows most commonly out of dead or dying beech trees and will often appear in enormous quantities. The fungus is completely white throughout, and a slightly enlarged base and slimy cap when wet. In drier conditions, the cap will still be slightly slimy or sticky. The fungus also has a small ring when the cap has flattened out. The picture above is of some porcelain mushrooms that I found while on a long hike in Surrey, England. Above you read how I learned to identify these five mushrooms. I cannot stress this enough that NOBODY must every consume a mushroom without 100% certainty of its identity. Always consult more than just one book or website. The information above is only relevant to fungi found in the British Isles. Other countries may have different types of fungi which are not taken into account in this blog. Hi @digitaldan! Yes, I agree. I always spend lots of time making sure I really have what I am looking for. I have plans for next spring to start growing oyster mushrooms as well! Maybe you could give me a few tips. Cool post! In Colorado we find porcini, morel, lactarius, slippery jack, and fly agaric. Little known fact, there's a way to consume fly agaric as an edible mushroom that involves parboiling 4+ times while pouring the water off between boils to remove the toxic compounds. I've never tried it, as 4x parboiled mushroom does not at all sound appetizing to me 😂 but supposedly it can be done. It's psychoactive effects are dissociative. I love mushrooms and it's so exciting to see new people getting into identification and foraging of these awesome purifying spirits of the forest! There's so much to learn about the mushies and their benefits to individuals, to the planet, to the spirit, simply amaze me. Thanks for sharing. If you want to learn about lactarius, check out my feed! I posted a little blurb about them a couple months ago. Forage on! Yes, we find much the same here! I have heard about this parboiling method before, but like you said, it sounds truly disgusting! I checked out your post about the Lactarius and it was really cool! We have that same mushroom here but there are a few look-a-likes to them so I tend to look for them for the purposes of identification only. I have looked everywhere but the morel still eludes me! Maybe someday I should so lucky as to find one! We see morel here because we got a lot of forest fires and they tend to grow in the burn areas a year or two after a big burn. If there's any areas like that near you, you should check them out :-) you might have more luck there. Happy foraging!